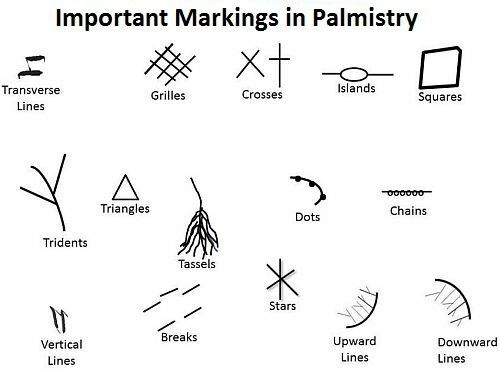 Markings and Symbols in the Palm are Positive or Negative interruptions and blockages in the normal flow of the lines in the palm, mounts and fingers. Some symbols or markings like Triangles indicate positive energy or even results and symbols like crosses indicate negative results based on the line they are positioned on and yield those results based on where exactly they are located. Example : A triangle formed on the Apollo (Sun) line at the middle (line starts from edge of palm, below mercury mount) indicates fame in middle age. The exact age can be derived by dividing the apollo line in ratio of person’s lifetime and triangle’s placement/interception indicates the age at which fame is achieved. Negative markings or symbols indicate difficulties, separations, traumatic events or could even be health problems. Few symbols indicate a period of recovery, problem resolution, or an emotional healing period for that person. Breaks : Breaks in the major or minor lines of the Palm can represent both positives and negatives, depending on which way they lie from the various lines. Breaks going toward the thumb indicate a new direction in a career. Breaks in the upward direction towards the edges of the hands may suggest an unexpected or unplanned journey. If they are pointing towards the base of the palm this can mean an unexpected turn in your daily routine. These breaks can indicate that there is an interruption in your normal flow of energy or signify a redirection in your life path. Breaks are usually diversions or distractions and depend on how and where they are being formed. Chains : Chains denote the different obstacles that you may face in your life. They signify a difficult or not so privileged upbringing during childhood. Also, chains in lines of the palm relate to the experiences in your love life. Chains also indicate times of indecisiveness and even health problems. Length of the chain correlates to the duration of time that all of these issues can last. Crosses : Crosses are an indication of the long-lasting problems and issues. They also represent major changes that will occur in life. Depending on where their placement on your palm, they can be indicating positive or negative changes. They are even a sign that few adversaries want to cause harm to you. They also represent outside influences that are causing stress on you. Crosses are also indicators of your state of mind and how you are going to handle your spiritual life. Grilles : Grilles most oftenly appear on the mounts of the palm. They signify negative indications and represent problems and adjustments. A grille on any part of the palm disperses energy and it represents bewilderment or insecurity at times in your life. Grilles signify interruptions in a person’s advancement. They can also signify beginnings or hindrances, with respect to the life’s ventures. You would also be continually exhausted by various anxieties and annoyances. Dots : Dots are not always well seen on the palm and they can sometimes be very tiny too. Dots represent concerns about ill health, relationships or another type of destructive and bad experience. They can also represent significant and monumental events that have created crisis in your life. They are also warning signs of danger in your life path. In experience, Dots disappear when unfortunate circumstances and issues are solved, so their appearance is not permanent. Islands : Islands indicate unfavorable interruptions in your life. They indicate stressful periods, either in career or may be by some person causing mental stress due to a bad relation. They also indicate fearfulness and weakness in health, in particular, inherited heart disease or a disturbance or breakage in your energy. It is important to look closely at the island to be sure that it does end and the lines continue further . Island on Life Line which ends the line itself is dangerous and can lead to drastic situations like suicide. Stars : Stars on the palm indicate success and good fortune in the area/mount/line they appear. But a star appearing on life line may be representing a huge turmoil. If a star is found at the end of a line, it can indicate fame and great accomplishments. It also indicates success in relationships. If found in line or mount of saturn, these stars can signify misfortune, emotional problems and lack of confidence in career. Squares : Squares are a positive sign on the palm as they are an indication of protection, especially when they appear around line breaks. They symbolize good luck from outside forces, for example, one’s guardian angel, guru or spiritual guide. But, a square can represent a time period of being boxed in or imprisonment if it is on a line that has no break in its path. Tassles : Tassels, also known as frayed lines, indicate confusion or chaos about a particular situation or a problem. They could also indicate a physical, emotional or spiritual decline. It is often found at the end of the life line as an individual ages. Transverse Markings : These are negative symbols because they take away the strength and deplete positive energy of the line or mount they are found on. They create obstacles wherever they appear. It also indicates that you may be using your skills for bad purposes. Traingles : Triangles are very lucky markings and indicate huge success. They signify that the individual has an ability to analyze situations effectively and has the brainpower to accomplish multiple tasks. When they appear on a specific line, they strengthen the qualities of that line. They can also be symbolic of someone who is spiritual or psychic. For example, a triangle on sun line indicates huge fame at national or international level. Tridents : A trident on the palm is also a very lucky marking. It always increases the qualities of the lines or mounts it appears on. It even has positive effect on the neighboring mounts. It brings good fortune and means that you will be happy, healthy and wealthy in life. Branched Lines : Upward branched lines can indicate that you have overcome some of life’s roadblocks with your own determination. They indicate someone who will be successful and will achieve their goals over a period. They also indicate hopefulness and a good outlook on life. There is an idealistic and positive attitude associated with these lines. Downward branched lines represent times in which a situation has gotten out of your control. They indicate pessimism, unhappiness, negative energy and losses. Their appearance on palm may signify someone who does not think in a positive way. Depending from which line the downward lines appear it lessens the strength of that line and drains its energy. Vertical Lines : Vertical lines are usually good markings and represent positive energy. Do not confuse these lines with sister lines. Some people may have several vertical lines in different sections of the palm. They are an indicator of a person who could be in the health care or medical profession. If they are found on the mounts or other lines then they lessen or neutralize the negative qualities that might be lingering. If they cut through a horizontal line, it is an indication that you have conquered trials and tribulations.